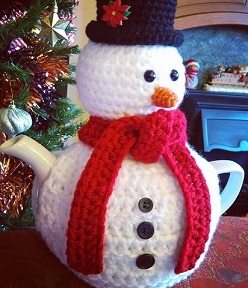 This friendly snowman keeps your tea lovely and warm, fits a 1 litre teapot (4 cup) and has lots of flexiblity regarding what colours to wear or even how many buttons to place on his chest! The pattern covers a range of techniques and makes suggestions of how to adapt the pattern to fit a larger teapot. Whether you are making for yourself or as a gift this cute little snowman will melt your heart. The pattern offers suggestions for where to find support for stitches and would be suitable for an adventurous beginner or a more experienced crocheter. Suggestions for other patterns or corrections always welcome.